Cherryvale Farms: Support us with edible credits. As a family, we’ve always been passionate about good food — real food. That’s why we grow all the organic fruits and vegetables we can fit on our little farm. Our “Everything But The” baking mixes are our way of sharing both our passion for food, and our commitment to organic products. 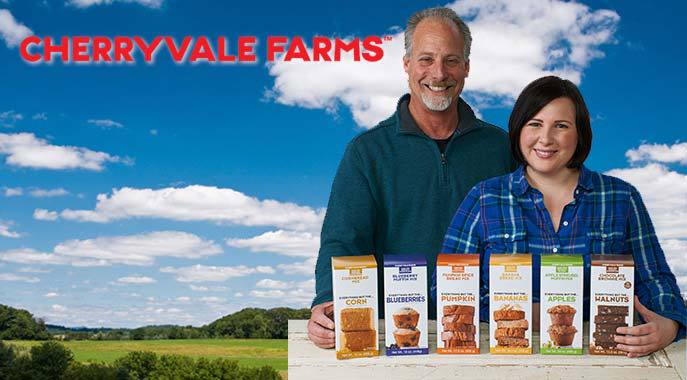 We hatched the idea for Cherryvale Farms’ “Everything But The” brand of easy-to-prepare baking mixes in our home kitchen — the Cherryvale Farm kitchen — in Santa Cruz County, California, because we love how baked goods taste when they are made with real fruits and vegetables. While we love being in the kitchen, we realize not everyone shares that devotion. And even if you do, today’s busy lives can really make it hard to find time to bake from scratch. That’s why we created our “Everything But The” recipes — so home cooks can whip up delicious baked goods in minutes, with a focus on fresh ingredients. We encourage you to use the best quality fruits, vegetables and nuts you can find when preparing our mixes. With funding from our fans, we can grow our business faster by developing new products, entering new markets and employing more local workers. With growth comes the opportunity to impact how more people eat - adding more fresh fruits and vegetables to their diets through delicious, healthier baked goods. Trying out Cherryvale Farms for the first time? Here's a low entry level for you to get started. At the register, use the Credibles app on your smartphone to redeem your credits for Cherryvale Farms.